Police have visited London rubbish tips in their hunt for missing computer discs containing personal details of 25 million people. The two Child Benefit discs containing names, dates of birth, bank and address details went missing on 18 October. They were lost when a junior official sent them by courier from Tyne and Wear to the National Audit Office in London. Police have visited several tips around London to check what waste was delivered there. A spokesman for Scotland Yard said: "We can confirm that police have been making inquiries at a number of rubbish tips." HM Revenue and Customs sent two discs containing the entire child benefit database, unregistered and unencrypted, to the National Audit Office - but they did not arrive. 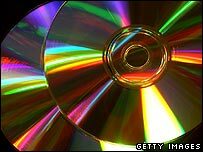 The government has apologised and said there was no evidence the discs had fallen into the wrong hands. HM Revenue and Customs says they are probably still on government property. But millions of families have been told to be on alert for fraudsters using their details, stored on the discs. An interim report into how the discs went missing is expected in December.